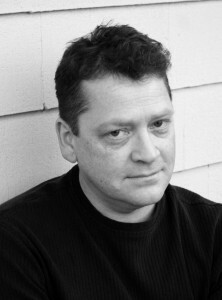 Dan Chaon’s fifth book, a collection of stories called Stay Awake, is due out in February 2012. He is the author of Await Your Reply and You Remind Me of Me, both novels, and two previous story collections, Among the Missing and Fitting Ends. He lives in Cleveland. Q (Meg Pokrass): Which writers and books do you feel closest to? Which authors do you return to time and again? The two most important writers to me have been Ray Carver and Ray Bradbury, kind of the twin poles of my writing mind. I also feel incredibly close to and in love with Shirley Jackson and Alice Munro, the female versions of the above. At different points have you had mentors? Do you mentor? I think the word “mentor” is kind of creepy, but I know what you mean. I’ve had some incredible teachers. My 7th grade English teacher, Mr. Christy, was the first person I knew who actually cared about the creative side of the world, and the first person who encouraged me to write fiction. My teacher at Northwestern, Reginald Gibbons, had a great effect on me. And my late wife, the writer Sheila Schwartz, was one of my teachers before we got married, and was a truly great mentor and muse for me, to the extent that I don’t know how I would have become a writer without her. I teach at Oberlin College, and I love my students. I’ve had so many amazing students that I can hardly count them. I would tend to call myself more of a coach or a fellow-traveller than a “mentor,” but like I said that word makes me uncomfortable. Here’s one trick: get really drunk or stoned and fall asleep weeping on your keyboard. When you wake up, magical elves will have come in the night and turned your bitter tears into words and paragraphs, just like they made shoes for that shoemaker. Actually, that doesn’t work most of the time, but I keep trying it. Another trick, this one somewhat less self-destructive, was suggested to me by a teacher, and has worked on occasion: Make a list of 40-50 things that could potentially happen next in your story. Don’t worry if they are boring, or improbable, or stupid. Just make a list as quickly as possible. Then take 5-10 of them, and write one or two paragraphs for each one. Somewhere in this process, you are going to get unstuck. Otherwise, I need to put the piece aside and start something new. I’ve never been at a loss for new material, for whatever reason. It’s never a problem to start something — finishing is always an issue. Favorite exercises you would like to share? Here’s one that I’ve been using recently, as I was trying to think about the ways in which scene in comics could be applied to fiction: The box exercise. Use Word or whatever word processing program to create a table of 3 columns and two rows. Your table should be no larger than a single sheet of 8 ½ x 11 paper. Now you should have six boxes. Utilizing 12 point type, fill each of the boxes with a paragraph or series of sentences which represents a scene or section of a story. Think of each box as a contained unit — but at the same time, try to come up with a piece which is both compelling as an interconnected narrative and beautifully written and vivid. In general, do you know who your characters are before you write or do you find out who they are in the writing? I always discover the characters as I go along. They come to me in stages, sort of the way people come to you in stages as you get to know them. It’s sort of like doing a Tarot reading for someone. You find the images and archetypes and moments that add up to a complex sense of the past, present, future of the character. You don’t always know what those are at first, not usually until the second draft. Writing Await Your Reply — how firm were your story lines starting out? How solidly did you plan them at the start, and what surprised you about the way they changed (if they did)? How much does your writing change when doing the writing? I didn’t have a plan in mind, actually, so most of it was a surprise. I had four threads, four sets of characters that I was working with, and I knew that they were connected but I didn’t know how. I wrote back and forth between them, round-robin style, and as I went I played around with various kind of connections. But in truth my subconscious mind was doing most of the work. I didn’t know the “secret” of the novel or the characters until I was almost finished with the first draft. The second and third drafts allowed me to put those discoveries into a more polished and sensible form, and I love that process. I like having this kind of inchoate mess that I can begin to shape into something that feels like order. For me, the fun of writing is that process of transformation and discovery-engaging in improvisation and “playing pretend,” the way you did when you were a kid, with no plan or end point in mind, and then taking that improvisation and turning it into something more formal and organized. What things have you had to unlearn as a writer? Most of the mistakes I made as a beginning writer, I continue to make again and again. It’s part of the process, I guess. I keep trying to get to a place in my mind where I’m not attached to results, where I’m just enjoying the fun of play, of creating people and worlds and situations for my mind to mess around with. The part that’s hardest is when I start thinking about the stuff beyond the scope of the actual work, because there’s an aspect of being a writer that feels constantly like being in Junior High. Will I ever publish a story in the New Yorker? Probably not. Will the cool po-mo hipster guys ever think I’m cool too? In a pig’s eye. Will I ever please that Amazon reviewer who found my work boring and depressing, and my characters unlikable? Highly doubtful. It’s very hard — weirdly hard — to clear your mind of all that crap so that you can just sit down and write and find that place where you’re just involved and enjoying the imaginary place you’ve discovered. All the other “problems” with writing are just puzzles, and they can be interesting to try to crack, even when it’s frustrating. Best writing advice you have ever had? It’s very good advice. I have it framed, and it is right near my workspace so I can look at it when I need to. I’ve been working on a story about zombies for an upcoming horror anthology called The New Dead. In the meantime I’m trying to find my way through the maze of a first draft of a new novel, which has been kind of recalcitrant. I actually have no idea what it’s about or what I’m doing. It’s kind of a scary, but also sort of fun. Some interesting exercises there – and you corresponded with Ray Bradbury? Amazing. Great interview, Meg. “Await your reply” seems like a difficult book for a writer to contstruct, difficult in terms of how it handles exposition. I think that the result was flawless … a fascinating book. Appreciate the ‘falling asleep drunk, magical elves’ approach to literature. Great interview, Meg. And Dan Chaon? More proof that Cleveland is not as intellectually deprived as it looks. I remember telling every reader I knew, “You have to read “You Remind Me Of Me.” Incredible first novel.” Glad to see you followed through, Mr. Dan Chaon. . . Cleveland. Indeed. I’m from Chicago and believed having to live in the Cleveland/Akron area was a terrible joke the god’s had played on me. Meg, well done, as usual. . . .
See, MaryAnne, you give yourself away by saying you lived in the “Cleveland/Akron area” …that’s not Cleveland. That’s exurbia. Cleveland is actually pretty fun, if you know the right people. Dan, re the cool po-mo hipsters you reference — whenever I’m tempted to bemoan the same thing, I think about the hipness that folks of our age lived through back in the day and take comfort in the fact that it far, far outshines any current version of cool. There’s no ski cap or skinny jeans or ironic mustache that could possibly be better than it was to suddenly be legal in the early ’80s and out on the town, whichever town it was. Great god almighty. And I love the Ray Bradbury postcard… I have one from Robert Crumb saying about the same thing and will treasure it always. I enjoyed this chat, Dan and Meg. Thanks for your insights and witty reparte. I enjoy your work, Dan, always have. Keep on keepin’ on. Those students of yours are some fortunate peeps. Very interesting interview about the writing process and writing worries. I like how you have both Rays and Jackson and Munro as favorite authors.